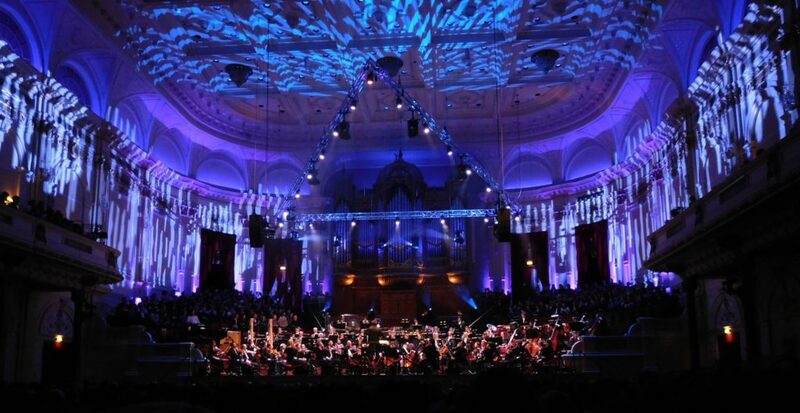 In my humble opinion, “Het Concertgebouw” in Amsterdam is one of the best venues we have to offer here in The Netherlands. When they announced a Star Wars concert in this venue, it was pretty clear I had to buy tickets. The program looked awesome as well, with a lot of music from the Star Wars movies and a couple of other interesting pieces. When we arrived at the venue we saw a lot of Star Wars shirts at this sold out concert, a good omen for a good evening. After a glance at the program, we were a bit surprised that the concert did not start with the “Main Titles,” but with the “The Imperial March.” The reason for this became crystal clear when Darth Vader’s breathing started and the orchestra started to loop the first couple of seconds, while Darth Vader descended the stairs. When he arrived on the conductor’s stage he removed his helmet and revealed that he was actually the conductor of the evening: John Axelrod. While still wearing his cape he continued to conduct the march. The screaming horns were just perfect and showcased how fantastic the acoustics of this venue really are. When it was done, host Leona Phillips walked on the stage in a very unusual dress and welcomed the audience, giving Axelrod the opportunity to change clothes. When he returned, he started to conduct the “Fox Fanfare” before the “Main Titles,” which gave me goosebumps and my eyes even started watering. After a beautiful “Yoda’s Theme” we could listen to “The Asteroid Field,” which I never had the pleasure of hearing live. It was quite a privilege to finally experience that piece in a concert hall. After these Star Wars pieces, we could listen to “Ride of the Valkyries” from Richard Wagner, inventor of the leitmotif , a concept that John Williams heavily uses heavily in his music. This piece was a good demonstration of Axelrod’s very aggressive conducting style. The highlight for me was the brass, with a solid solo for the tuba player. Apparently, Axelrod agreed with me because all the brass players were asked to stand to receive extra appreciation from the audience. Before the break, we could enjoy three pieces from Star Wars: The Force Awakens. “Rey’s Theme” was performed beautifully. I was hoping for goosebumps though, but sadly that did not happen. After such a delicate piece I needed a couple of seconds to adjust to, the louder “March of the Resistance”. But, it was still a very solid performance. During the “The Jedi Steps and Finale” the Dutch Garrison of the 501st Legion, which is a Star Wars cosplay group, made their appearance in the hall. The costumes were just awesome to see from up close, especially the Chewbacca one was just gorgeous, and despite some weird tempo swings, so was the music. After the intermission we could listen to “Battle of the Heroes” where our fears became a reality: there was no choir. Host Phillips had apparently won a conducting contest on a reality show and was allowed to show off her conducting skills. I was quite surprised at what she was able to do. I have seen this gimmick before, but she really pulled it off. The orchestra performed the piece very well, but without the choir, the music was missing the magical touch. The timpani, for example, were very loud with only the orchestra playing. After the piece, Axelrod was allowed back on stage to conduct “Mars” from The Planets as another example of where John Williams got his inspiration. The venue was colored red by the lights and I noticed a euphonium, which is a smaller version of a tuba, in the orchestra that was played very well. 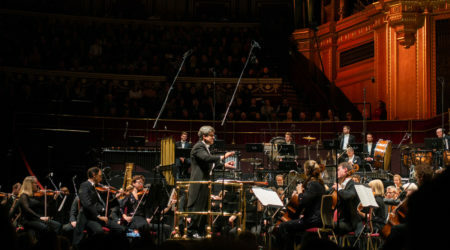 The piece was another example of Axelrod’s conducting style fitting very well with the music, and when it was over the whole orchestra was allowed to stand. During the next segment, the host and Axelrod explained to the audience, using musical fragments, that Stravinsky’s Rite of Spring has music that is very similar to Star Wars. For another inspiration source for Williams, the orchestra played a suite from Kings Row written by Erich Korngold, and we could indeed hear some similarities with Star Wars. Since there was no choir present for this evening, Axelrod asked the audience for assistance. He divided the concert hall audience into four groups, who all had the yell one of the four words from the piece. The result was quite impressive. Sadly I would still prefer a choir for Duel of the Fates though. Without it, the magic is lost, like with “Battle of the Heroes.” The other pieces: “Scherzo for X-Wings,” “Princess Leia’s Theme,” and “Throne Room and Finale” were very well done. The last one even had Axelrod marching on his stage. 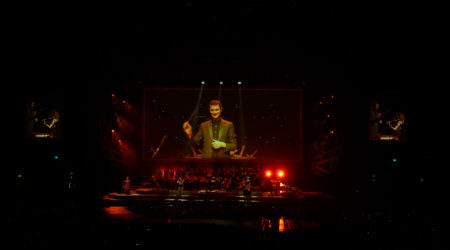 When the final notes had been played, the audience jumped to its feet straight away for a standing ovation. I have never experienced an audience standing up so quickly. We noticed that “Across the Stars,” which was in the program, had not been played at all, so it came as no surprise to us that it was played as an encore. What was surprising though were little light strings that the double bass players had attached to their bows, creating a lightsaber effect. We had a delightful evening. 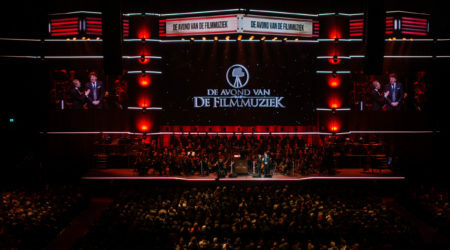 The concert was a great introduction to film music for an audience that was mainly a fan of Star Wars movies and was of all different ages. Sadly, some people in the audience were not used to attending such concerts and their whispers were annoying from time to time, but it was sporadic and luckily did not become a huge problem for me. Fun fact of the concert was that no music from Return of the Jedi was played . Personally, I would have preferred music from that movie over the two pieces that needed a choir. Be that as it may, I was overruled by the rest of the audience with the fastest standing ovation I have ever witnessed and hopefully, this concert has converted some movie enthusiasts into film music fans. Thank you for this flattering review. We intend to do the same in Seville Spain in June 2019! Come visit and enjoy!